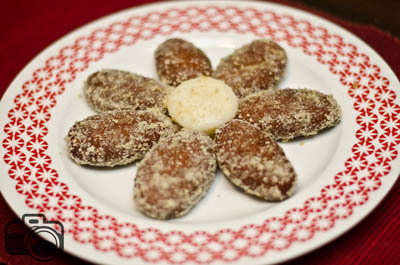 Cham cham or Chum Chum is a traditional Bengali sweet which comes in various colours. It is normally coated with mawa. Cham cham is for those who really really love sweet ( specially for my dad who has the sweetest tooth I ever seen). Check out my chhana recipe. 1. Now need to squeeze the cheese to extract the water. Make sure the cheese has no excess water otherwise Cham cham will break into pieces. 2. The cheese needs to be kneaded 2 minutes. Then add sugar, semolina, plain flour, self raising flour and cardamom powder. Knead the cheese until your palm feels a little greasy. You can use food processor for kneading then it will be a lot easier. 3. Now divide the dough into 20 equal parts and make them into oval shaped ball. 4. Heat the pan with 7 cups water and add the sugar on medium high. Bring it to boil and add the balls to the syrup. Cover the pan with the lid. 5. Need to boil the ball 80 minutes but need add ½ cup of water in every 10 minutes. 6. Make caramel of sugar and add with syrup. 7. Cook 10 minutes more and turn off the heat. Add 1 cup of hot water in syrup and let it cool down. 8. Take out Cham cham from syrup and roll in mawa. Cham cham is ready to serve. ur dish looks delicious and i want to try ur chum chum. just 1 question….how did ur chum chum turn brown without frying?? thanks for you question.For caramel it turns out brownish…. i use more caramel…if you use less caramel colour will be lighter…. HI will the Caramel make the mishti brown?? why u did not use baking powder?? did the mishti became double without that?? I was trying to make chumchum, but my chumchum didn’t trun double size when I was boiling them. I boil about 90minutes, it did trun brown, but very hard as syrup didn’t get in. where did I make the mistake? there is chance that your Chhana is too dry or self raising flour is not working. Please make sure ingredients are fresh and right amount. Time and process will be same. but i hope enough large sauce pan for that. Thanks. I will make it but one question when I need to add the caramel? Hi Rownak,ami janta cai j caramel ta pudding bananor caramel er moto eki hoba?atar bapara aktu bujhiya bolla valo hoy.r thik kon somoyta mista caramel dibo.kotokhon rakhbo.why don’t you upload video of your recipe?that will be great help for us.I want to try it. Love to make video but need helper for that. Hope to do it in near future. here in this recipe I add caramel after 80 minutes then cook 1o more minutes. but literally you add caramel in any time. same like pudding bananor caramel. Hope its clear now. Rownok apu, Self Raising Flower bolte ki bujhai? eta ki shudhu Moida naki onno kisu? self raising holo moida r baking powder misano. please check your nearest grocery shop. thanks. Hi.I made chamcham.it was perfect but the colour isn’t perfect.how can I make caramel perfect that gives me nice colour? Please let me know which colour comes out in your one? the colour was too light.I want brown colour.please let me know how can I make caramel. Hi Rownak, thanks for your chamcham recipe. I have been looking for this for so long.Could you please tell how to make the dry Mawa at home. I tried with cream but it turned out to be sticky not dry. Is the grocery store’s Mawa good to use in Chamcham? Thanks for your blog. Great and easy to follow recipes. They’re a life saver when you’re abroad. Looking forward to trying them all…! Apu, thanks a lot for this recipe. I was looking for this recipe for long time. today I made cham cham following your recipe. It was absolutely fine. everything was OK ( colour and size). But about sweetness it was not as sweet as those we buy from shops. and the syrup inside the cham cham was not sticky enough. It was really thin syrup (watery).. should I cook longer than 90 minutes? if so for how long? I have one more question apu. What can I do with the leftover syrup? Hi,Rownak.How r u?I made chamcham yesterday.It was perfect teste and colour.Many many thanks for this recipe.My daughter and Hubby like this. Hi Rownak, I was wondering if I can use a smaller size pot. What is the minimum size so that all the sweets will be okay in there? Hi! You have nt mentioned smaller means”how small”. I will say to try with 1 litre milk. 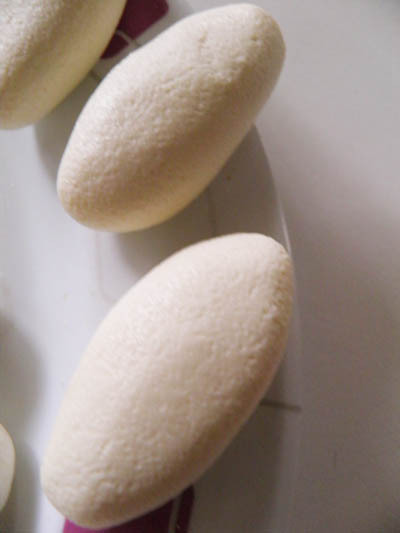 You can make smaller and bigger size chamcham as per your wish but remember it will be double in size when you are boiling it, so give enough space for that. hope it will help. Thanks.